The End was written by Michael Pinchbeck over a year ago, and the performance at the greenroom planned long before the new funding budgets by the Arts Council were announced, including devastating cuts for the greenroom. It felt very different. It felt as though the play was written for just the situation the greenroom finds itself in - having to close after nearly 25 years of service as one of Manchester’s cutting edge venues, helping to develop new and experimental talent. Inspired by the stage direction from The Winter’s Tale by William Shakespeare – ‘Exit pursued by a bear’, The End explores endings and exits and continues an interest in the reenactment of real life events to investigate absence and loss. The End was Pinchbeck’s last performance and the greenroom's penultimate one, closing at the end of May. 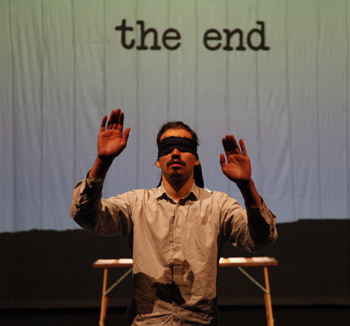 With an ironic twist of fate, The End was commissioned by Chester Performs and supported by the National Lottery through Arts Council England. The End sets out to ask why we perform and how we will know how to stop, and is both a love letter and a resignation letter to the theatre. Devised in collaboration with Ollie Smith and Mole Wetherell (Reckless Sleepers), with visual artist Hetain Patel as a dramaturg and an original live soundtrack by Chris Cousin (Bathysphere), The End is performed by Michael Pinchbeck and Ollie Smith. The story runs through examples that express how Michael, now 35, is full of existential disillusionment and resigned to showing Ollie the ropes as he prepares to take over from him, but only seems to make himself look poor in comparison. Ollie, a youthful 25 is full of hopes and dreams and, according to Michael, has it all to learn. Michael has decided to call it a day, to make this show his swansong, whilst Ollie is left to pick up the pieces. It may well be a natural outcome of writing a script about yourself backing out of a collaborative situation or career you don't feel a part of anymore, yet still wanting to write the story of yourself as a purposeful agent, but I feel the script didn't quite work and was left wanting in one important respect. It definitely works to reflect the approach of someone resigned to their own disillusionment, but Michael presents himself as someone who's purposefully stepping back and allowing the new generation to take over and here's where the contradictions arise. Firstly, because he is disillusioned with his own theatrical acheivements and resigned to never succeeding, Michael lacks the purpose required to consciously pass things on to the next generation. Secondly, Ollie is clearly the better all rounder - more knowledgeable about the theatre, flexible in role and able to compensate for Michael's weaknesses rather than vice versa. Thirdly, Ollie isn't looking to sweep Michael aside, upstage him, or even to take on more of a role but does so during the performance only because Michael increasingly gives up as he gets ready to depart. Simply scripting Ollie in a role of apprentice so as to present himself as passing things on to the new generation doesn't adequately resolve the contradiction. Although not seemingly intentional - from the script, or from the after performance Question and Answer section - I think The End unwittingly exposes a serious political problem of our time - also exposed in the production of EPIC at greenroom the week before this performance, and reviewed previously. The old order may have lost their way, lack confidence about their own actions or pupose, but there is something of a historical anomoly whereby the next generation are absent in terms of new ideas and somewhat tentative about taking over. Even though Michael is clearly part of the new generation and would in other historical periods be looking to take control and make his own generation's history, he doesn't seem able to articulate that and creates an image for himself that passively stands aside for someone else to take control. These are strange times indeed, and the sooner Michael's The End leads to a new beginning the better, though for a young generation who are trying to write themselves out of history before they try and make any there's clearly a problem. The collapse of an old order provides space to manoevre and experiment, but relying on someone else to need you to take control because of their absense is way too passive for me. Michael Pinchbeck Michael is a writer, live artist and performance maker based in Nottingham. He studied Theatre and Creative Writing at Lancaster University. He has worked with Metro-Boulot-Dodo, Reckless Sleepers and Strange Names Collective. In 2006, Michael was commissioned by Nottingham Playhouse to write The White Album. In 2011, Nottingham Playhouse will stage his second play - The Ashes. In 2008, Michael was selected by Arts Council England to represent the UK at the Biennale for Young Artists. In 2009, his work was selected for the British Council’s Edinburgh Showcase. In 2010, he was invited to work as a dramaturg at the Southbank Centre. 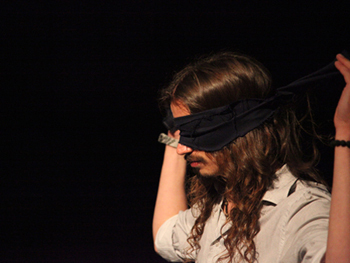 He has a Masters in Performance and Live Art from Nottingham Trent University and is currently pursuing a PhD at Loughborough University exploring the role of dramaturgs in contemporary performance. Michael Pinchbeck will be performing in Schrodingers Box by Reckless Sleepers at the Lowry, Manchester on Monday 6 and Tuesday 7 June 2011 The End is his last performance he has created for the theatre. Ollie Smith Ollie is a writer, live artist and performance maker based in Nottingham. He studied Acting at Bretton Hall College. Since graduating in 2007, he has created work that explores themes of isolation and belonging, including Alone Time and Help Yourself - a Method Lab commission at greenroom (Manchester). Ollie has also been experimenting with durational work in a series of collaborations and solo performances including Dressing The Part and Non sequitur. In 2010, he was commissioned by Theatre Writing Partnership to write a site-specific work, Do Not Enter: Performance in Progress, for the Momentum festival at Curve Theatre (Leicester). Ollie first collaborated with Michael on a work-in-progress of The End at The Junction (Cambridge) in May 2010.